Space debris is a hazard to satellites and spacecraft as well as a contributor to near-Earth space pollution — to help raise awareness of this issue, ESA’s Education Office is organizing the first ESA Academy Space Debris Training Course. 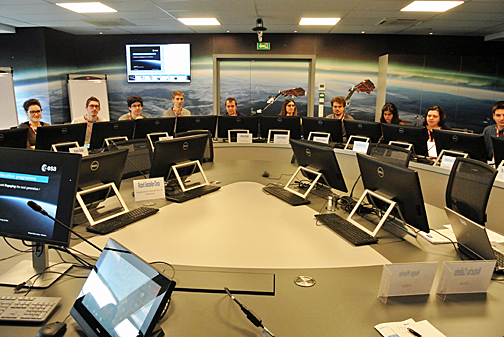 Students in ESA's Training and Learning Center. The Space Debris Training Course will be hosted at the ESA Academy's Training & Learning Center in ESEC, Redu, Belgium, from April 16 to 20, 2018. University students will be provided with an introduction to the concept of space debris, why it is necessary to address this problem, and how the mitigation policies set by ESA apply to missions. Participants will not only learn about the space debris environment and mitigation technologies, but also about how it impacts spacecraft operations, and potential future solutions. Taught by ESA experts mainly from ESA’s Space Debris Office, as well as external experts from the sector, the course will be delivered through formal technical lectures complemented with hands-on exercises based on a real-life case study. This training course is a collaboration between ESA’s Education Office and ESA’s Space Debris Office, which coordinates ESA's research activities in all major debris disciplines. These include measurements, modelling, protection, and mitigation. It also implements the space surveillance segment of the Agency’s SSA program, operates ESA’s collision avoidance system for a fleet of 20 spacecraft, and represents ESA at international bodies on space debris matters such as the IADC (Inter-Agency Debris Coordination Committee) and UNCOPUOS (United Nations Committee on the Peaceful Uses of Outer Space). Students will be evaluated on the group exercise. Upon completion of the training course, they will receive a certificate and course transcript, allowing them to claim ECTS credits from their respective universities. The deadline for applications is February 26, 2018. The selected students will be sponsored by ESA. The sponsorship will cover accommodation and meals as well as up to 200 euros for traveling to Redu, Belgium.